Citation: C N Trueman "The Truman Doctrine"
The Truman Doctrine was the name given to a policy announced by US President Harry Trumanon March 12th, 1947. The Truman Doctrine was a very simple warning clearly made to the USSR – though the country was not mentioned by name – that the USA would intervene to support any nation that was being threatened by a takeover by an armed minority. The Truman Doctrine has to be assessed against the background of what had happened in Europe at the end of World War Two and in the immediate aftermath. During the war conferences, Stalin had made it clear (as far as Roosevelt and Churchill were concerned) that he would allow free elections in the east European countries previously occupied by Nazi forces and that had been liberated by the Red Army in its drive to Berlin. To Roosevelt, his successor Truman and Churchill this seeming promise meant that anyone could stand for election, anyone over a certain age could freely vote and that voting would be done in secret – effectively a carbon copy of what the west took for granted when it came to elections. Stalin clearly had other ideas. He wanted to put what Churchill was to call an “Iron Curtain” around the USSR and that meant each eastern European country that was near to the Soviet border had to have a loyal communist government in power with leaders who would do what Stalin wished. Therefore, elections were never going to be fair. Poland, Hungary, Bulgaria and Rumania all ended up with communist governments and had leaders who looked to Moscow for advice as opposed to the people of the country they governed. The only oddity for Stalin was Yugoslavia led by Tito. He was communist but Tito was not prepared to simply see the Nazis replaced by the influence of Soviet communists. Then in 1946 communists in Greece attempted a takeover. They were in the minority in the country but received moral support from the USSR in their efforts to overthrow the monarchy and actual material support from Yugoslavia. Greece was in a highly sensitive position militarily and Truman, while not wanting to involve America in any military action, wanted to give the Greek government as much support as he could during the Greek Civil War. The USSR’s Black Sea Fleet was effectively bottled up in the Black Sea. It had to use the narrow waterway through Turkey – the Dardanelles – to get into the Mediterranean Sea. All its movements were easy to monitor – even submarines, as listening devices had been placed on the seabed that easily picked up the noise of a submarine’s engines. If the USSR could get an ally physically in the Mediterranean Sea, then such a hindrance would not exist as a naval base could be built in a Soviet-friendly state. So Truman’s stated policy – the Truman Doctrine – was not just about supporting the rights of a majority against the armed might of a minority, it also had a strategic bearing to it. Congress agreed to send $400 million in military and economic aid to support the government of Greece. There was a shared view that if Greece fell to the communists, Turkey would be next and that the Soviet Union was slowly creeping towards the oil fields of the Middle East. However, there was no support to send US military forces into Greece. 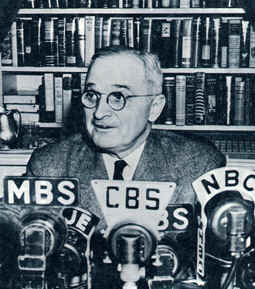 The Truman Doctrine was to set the tone for US foreign policy throughout the world post-March 1947. Greece and Turkey became members of NATO – a clear message to Moscow that an attack on either would be deemed by other members of NATO to be an attack on all of them.